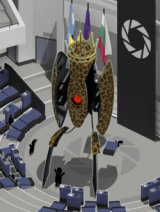 The Animal King Turret is an enormous Sentry Turret introduced in the first Portal 2 chapter, The Courtesy Call. The Animal King first appears in the "Animal King Takeover" public service announcement slideshow when the Announcer is about to give advice about what to do when Earth is being taken over by an "animal king, sentient cloud, or other governing body that either refuses to or is incapable of listening to reason", before he is cut short. In the slideshow, the Animal King, appearing as a gigantic Turret covered with a leopard skin-patterned texture and wearing a crown, drops into a large amphitheater and opens, causing people to either flee or bow to it. The Animal King appears again in the back of the amphitheater (it may be the same as in the slideshow, even if the designs differ) during the Turret Opera at the very end of the game, where it is shown to be playing the deeper bass tones of the opera. A smaller version of the Animal King, minus the crown, can be seen in one Aperture Investment Opportunity #3. "Animal King" is a registered trademark of Aperture Science, copyrighted 1998. 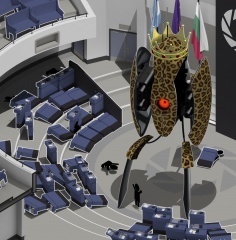 During PAX Prime 2012 in Seattle, Portal 2 writers Chet Faliszek and Erik Wolpaw revealed, that Chell was to find a lost tribe of turrets and the Animal King Turret was to marry off one of its turrets to Chell. The Animal King Turret makes a cameo appearance in LEGO Dimensions, where it is summoned by the main characters to destroy debris blocking the entrance to Minas Tirith. 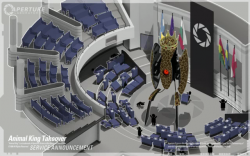 The Animal King Turret as it appears in Chamberlock informational videos. This page was last modified on 28 April 2016, at 16:54.